Proconsul Skull. A hominodea, Cranium from ancestral hominoid. Early Miocene of east Africa,(22 MYA) Rusinga Island, Kenya. 1948 M.D. Leakey. Proconsul was an early genus of primates that existed from 27 to 17 million years ago during the Miocene epoch, first in Kenya, and restricted to Africa. Four species have been classified to date ranging in size from 22-84 lbs (10-40 kg). They inhabited rain forests. They had a mixture of Old World monkey and ape characteristics, so their placement in the ape super family Hominoidea is tentative; some scientists place Proconsul outside of Hominoidea, before the split of the apes and Old World monkeys. 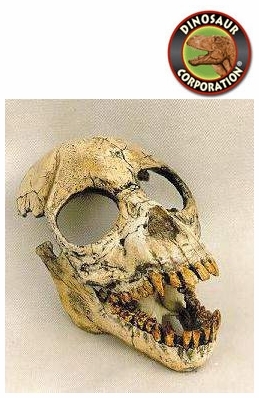 If Proconsul is not an ape, then it would be somewhat closely related to Aegyptopithecus. Proconsul's monkey-like features include thin tooth enamel, a light build with a narrow chest and short forelimbs, and an arboreal quadrupedal lifestyle. Its ape-like features are its lack of a tail, ape-like elbows, and a slightly larger brain relative to body size.